Color was exactly what I was looking for and true to color on the website (cream). Don't get me wrong, it's plush, but not as much as I had thought from the description. I don't think the pile height is a full "2.2 inches." I will be adding a plush rug pad to help give it some more cushion. I tried to take a photo sans the pups, but they wouldn't get off the rug. They give it 5 stars. Find yourself drawn to your floor and the plush comfort of the Corang rug. 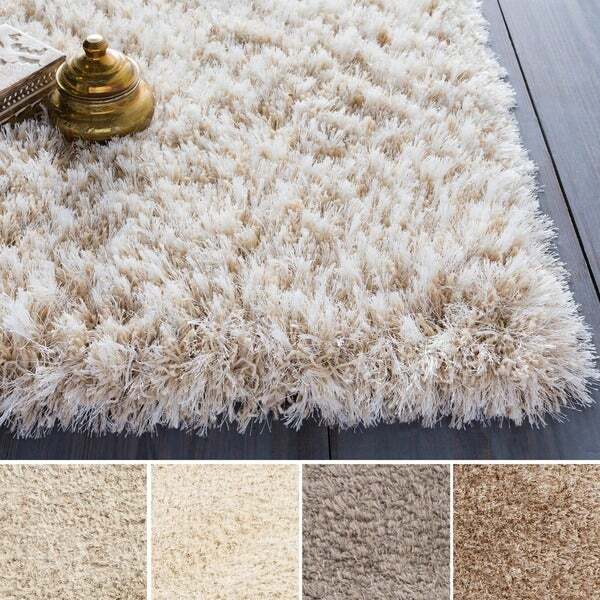 With a shag design in traditional solid neutral colors, this wool blend rug offers durable protection to your floor and homey softness to your design. This one is manufactured by Surya, Rhapsody collection. The rug is very nice and modern! The rug feature great textural dimensions. But this is not a hand-woven rug!!! This is actually MACHINE MADE rug. I wasn’t sure about the color for my family room. The sofa is tannish and the floors are beige with subtle tan flecks. We chose the desert sand. The color choice was perfect as it blended with my decor. It also has a beautiful sheen which makes it interesting. The choice of a shag is ideal for the family room because it makes the room feel comfortable and cozy. It ties the room together and has a designer look. The rug looks very high end. The weave is dense and plush. The price is good considering the excellent product. Similar rugs cost a lot more. I really love this rug!! I cannot say enough good things about this rug!!! I loved it so much I bought a 2nd one for our front living room in the lighter cream color. My favorite though is the main color in the 1st picture, forget the name, Sand or something... BEAUTIFUL! Very functional. Great quality, people think we spent thousands on it &amp; when I tell them how much we spent they are shocked! I put a good rug-pad under them &amp; they are even more comfortable to walk on... I've had NO problems vacuuming it either. I have the new Dyson V8 Cordless vacuum though, and so I use the carpet attachment, not sure if that makes a difference. perfect rug for our theater room. New wood floor was installed and with this rug the acoustics were greatly improved. plush, deep and the color works great! We are totally pleased with this purchase. This is a great rug. Really soft with a high plush fur. I've thrown it in the washer and dryer and it's come out looking new. Highly Recommend! Love it! This rug is very classy and looks great in our family room under a glass coffee table. It's super soft and has three different shades of color in it, depending on which way it is brushed. It does shed a little, but not enough to be troublesome. The absolutely most perfect rug ! It’s plush, thick . It looks so elegant . I get compliments on this rug all the time . The color thread is beautiful . I bought these rugs for my master bedroom to put on either side of the bed, and they are going to be perfect. They have a bit of dress to them (a bit of gold glitz), though nothing overwhelmingly dressy,which is how I expected and wanted them to be. I think they would do well in a variety of decors and settings! I have not actually put them down yet, so I can't say for sure how they'll hold up, but I can say that they seem very durable just from examining them. Very happy with this purchase! I ordered the khaki color and received the multi beige instead but actually loved the color blend so much I decided to keep it. It looks like a show home with this beautiful carpet. This is an awesome rug. Great color, soft feel, everyone mentions how nice it looks as they walk into my living area!! Have had this rug over a year now and our Lakehouse and it does not shed provides adequate cushion and looks fantastic. Vacuums up also nicely without any shedding. Came packaged very well. I recommend this. This rug is just as cozy and fluffy as it looks in the pictures. The color is beautiful as well. I bought this for our living room and I like it so much, I’m purchasing another one to put in our basement movie room. This rug was purchased for a dorm room. Two years in, still looks great, even with cats. A little harder to vacuum due to the tall pile, but not impossible. "It says that the materials are: Polyester, Synthetic, Wool; Can anyone tell me if the label tells percentages or if the backing is wool and shag part is polyester, etc? My kids have allergic reactions to certain synthetic fabrics. Also did the rug have any kind of chemical smell?" "I love this rug, the caption on it says Solid Beigh Corang Rug, but the option say different. If I could get an 8X10 in the big picture Beigh I would order it. Can you let me know Dana "
"What color option is the first photo? Is it still available?" "The first rug pictured is Cream and Wheat color. Does Overstock have this color in stock?" My apologies, the cream and wheat color options are discontinued and out of stock. "The first rug pictured looks different than the color selection offered. What is the color of the first rug?" Is the beige color still avail in a 5x7.? The beige doesn’t come up as an option. "Is the Khaki color a brown or some type of green????" "What is the specific name of the color shown in the very first zoomed in picture ? " nuLOOM Handmade Plush Shag Rug - 7'6" x 9'6"